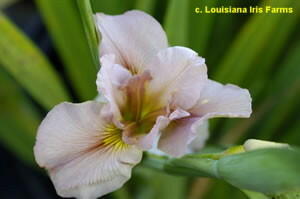 'Cajun Merry' (Mary Dunn, R. 1995). Seedling L174-1. LA, 36" (91 cm), Midseason bloom. Ecru mauve, Falls with tiny red brown lines at edge of green signal. 'Fat Tuesday' X 'Cammeray'. Bay View 1997.